If you haven’t heard of colloidal silver, and are looking for alternative therapies to common health issues, such as a sinus infection or a cold, you will soon. According to a report written by Richard Davies and Samuel Etris of The Silver Institute in a 1996, there are three primary ways that colloidal silver can help improve health. Catalytic Oxidation: Silver naturally holds onto oxygen molecules, which readily react with the sulfhydral (H) groups that surround bacterial and viruses. In turn, this helps block the life-preserving cellular process known as cellular respiration, which is defined as "the set of metabolic reactions and processes that take place in the cells of organisms to convert biochemical energy from nutrients into adenosine triphosphate (ATP), and then release waste products." Binding with DNA: Shown to literally enter bacteria DNA, up to 12% of silver has been detected in Pseudomonas aeruginosa. According to one source, “While it remains unclear exactly how the silver binds to the DNA without destroying the hydrogen bonds holding the lattice together, it nevertheless prevents the DNA from unwinding, an essential step for cellular replication to occur." Colloidal silver, unlike its modern prescription antibiotic counterpart, simply doesn’t create resistance or immunity in the organisms that are killed by it. This point cannot be emphasised enough, especially in light of the Centres for Disease Control and Prevention (CDC) recently reporting that more than 2 million people in the U.S. suffer illness every year as a result of antibiotic-resistant infections and 23,000 die from these infections. Research is beginning to reflect what many people have already known anecdotally for years - that colloidal silver can reduce swelling, speed healing, and boosts cell recovery! Colloidal silver is a remarkable product to help fight against bronchitis and pneumonia when ingested internally, but an even more effective way to utilise it? Simply breathe it into your lungs. Before the invention of the refrigerator, it was common practice to drop a silver coin into a container of milk as a preservative because silver was known to prevent the growth of algae, bacteria and other undesirable organisms. Dating back to ancient times, silver was also a popular remedy to stop the spread of diseases. Its use as a natural antibiotic continued all the way until the 1940s, when modern antibiotics arrived. Ionic silver solutions are products whose silver content primarily consists of silver ions. Although ionic silver is often marketed as colloidal silver, it’s not true colloidal silver. Because it’s the least expensive to produce, ionic silver is the most popular product in this category. The problem? It simply won’t produce the same benefits that true colloidal silver can. In order to keep large silver particles suspended, silver protein-based products add gelatin. Silver protein is the second-most popular type of colloidal silver product on the market and can easily be made by adding water to silver protein powder. Again, it’s also often marketed and labeled as colloidal silver, but should not be confused for the real thing. 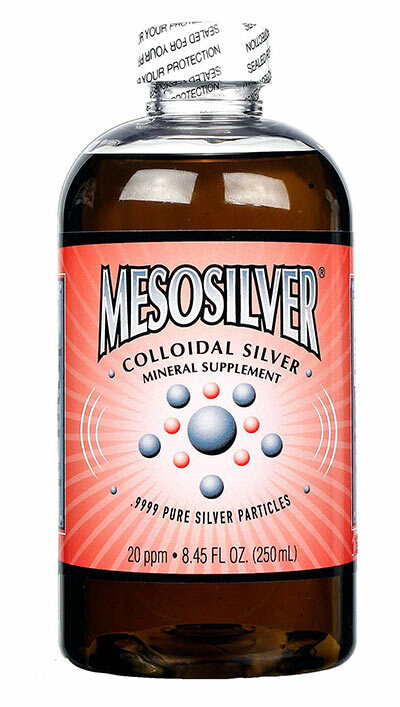 Silver protein is less effective for human use, and you won’t experience the true colloidal silver benefits. Lastly, true silver colloids don’t contain any protein or other additives, as the vast majority of the silver content consists of nanometre-sized silver particles. Although the National Centre for Complimentary and Integrative Health reports that colloidal silver may cause poor absorption of some drugs, there is limited research proving that side effects to colloidal silver use even exist. Nonetheless, you may come across many warnings about it causing an irreversible condition called argyria (when people turn blue). However, this is caused by misuse not of true colloidal silver, but through other cheaper products marketed as colloidal silver, such as ionic silver or silver protein. One point to consider is that, because colloidal silver is such a potent antibacterial agent, you should be sure to supplement with probiotics during use to be sure that you maintain a proper balance of microflora. There in no fixed dosage or methods for using Mesosilver colloidal silver but it can never cause any dangerous effects such as argyria.